Born 4 Jul 1866 Washington, Putnam County, Indiana, U.S.A.
U.S. Census Jackson, Clay County, IN 1880: "Charles Deal, age 15 b. Abt. 1866 Indiana parents b. Indiana, coal miner, as are his father, Daniel Deal, age 54 & brother, Noah Deal, age 20, in the same household. U.S. Census Raccoon, Parke County, IN 1900: Charles Deal, age 35 b. Jul 1864 Indiana, coal miner, can read/write, m. 1890 Ruth, age 29 b. Aug 1870 Illinois, parents b. Indiana, can read/write, mother of three children, two living in 1900 b. Indiana: Ethel 9 b. Jan 1891, Iva 7/12 b. Oct 1899." U.S. Census Ward 4 Brazil, Clay County, IN 1910: Charles Deal, age 44 b. Abt. 1866 Indiana parents b. Indiana,coal miner, wife Ruth L., age 38 b. Abt. 1872 Illinois, parents b. Indiana; two children b. Indiana: Ethel 19, Iva 10. Not related, but living in same household [boarder? ]: W.D. 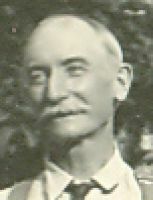 Underwood, age 52 b. Abt. 1858 Ohio, parents b. unknown, janitor in city jail." U.S. Census Indianapolis, Marion County, IN 1920: "Charles Deal, age 53 b. Abt. 1867 Indiana parents b. Indiana, laborer-auto factory, wife Ruth, age 48 b. Abt. 1872 Illinois, parents b. Indiana; one child b. Indiana: Iva, 20 b. Abt. 1900, stenographer-gas company." U.S. Census, Indianapolis, Marion, IN 1930: "Charles Deal, age 63 b. Abt. 1867 Indiana parents b. Indiana, night watchman-American Legion Headquarters; rent $45 month-never owned real estate, wife Ruth, age 58 b. Abt. 1872 Indiana [sic] parents b. Indiana; two cousins, b. Indiana parents b. Indiana: James Payne, age 29 b. Abt. 1901, telephone lineman, Frank Payne, age 24 b. Abt. 1906, not employed. Lodger: Bessie Goheen, age 44 b. Abt. 1886 Indiana, stenographer-saw mill." U.S. Census, Indianapolis, Marion, IN 1940: "Charles Deal, age 73 b. Abt. 1867 Indiana, education: 4 yrs, not employed, annual income $204 rent $8 mo, residence in 1935: same place, wife Ruth L., age 68 b. Abt. 1872 Illinois [sic], education: two yrs." Married 5 Feb 1850 Putnam County, Indiana, U.S.A.
Indiana Marriage Collection, 1800-1941: "Daniel N. Dial [sic] & Marinda [sic] Lucas, 5 Feb 1850 Putnam, IN"
Indiana Marriage Collection, 1800-1941: "Ruth L. Whittington, age 19, father Jacob, mother Martha, & Charles Deal, b. Putnam County, father Daniel Deal, residence: Centre Point, m. 13 Apr 1890 Clay County, by Rviel." Charles Deal was allowed to drink beer while he tended the vegetable garden, despite wife Ruth's strong objections to alcoholic beverages, because "drinking water while in a hot sun made him sick." In Indianapolis, Ruth Deal sometimes purchased a live chicken to cook. It was she, not husband Charles, who wrung the neck of the chicken strongly enough so that the head separated from the body, which then dropped to the ground and ran for a minute or so about the yard. Born - 4 Jul 1866 - Washington, Putnam County, Indiana, U.S.A.
Construction of this building was begun in 1871, when Charles Deal was about five years old. Parke County Courthouse, Rockville, Indiana, built 1879. In 1900, Charles Deal was a coal miner in Parke County, Indiana. In the 1896 directory for Clay County, Indiana, Charles Deal (1866-1945) and his brother Noah Deal (1859-1932) were listed as "miners" in Shaft No. 1 in the Brazil, Indiana Directory of 1896. Charles and Noah were listed as "miners" in the U.S. Census of 1880, so both had been working as miners for at least sixteen years. In 1930, Iva Florence Deal was a stenographer and her father, Charles Deal, was a night watchman in the west building. The building faces the memorial, four black granite columns topped by an golden eagle, to those who served in World War I. "The two American Legion buildings in the Sunken Garden define the east and west sides of the plaza at the north end. . . . The organization’s selection of Indianapolis for its national headquarters in 1919, the year the American Legion was formed, was the driving force behind the construction of the World War Memorial Plaza. Walker & Weeks designed the two Neo-Classical Revival American Legion headquarters buildings, placing them lengthwise within a sunken lawn area to emphasize the long axis of the entire plaza. Their plain Doric pilasters and restrained ornament make them subordinate to the main buildings visible from this location, the memorial and the public library. Although both were designed by the architects along with the 1923 master plan, the west building was built in 1925 and the larger east building not until 1950, using the original exterior plans and elevations drawn in 1923." Deal, Charles, miner at No. 1 Shaft of Coal Co., lived on Cass St, b. 1866 Putnam, IN & came to Clay County in 1895"
There were two other men named Deal, Charles (b. 1868 Ohio) and James (b. 1860 Ohio) who came to Clay County in 1888 and were the grandsons of a carpenter-painter, David Deal (b. 1798 Maryland) and sons of a carpenter-painter, David Deal (b. 1818 Ohio). There were six men named Decker, some of whom were born in Canada, Pennsylvania, and Clay County, and were plumbers, store-keepers, or fire insurance agents. This page lacked the code that indicated the church attended and political party voted.